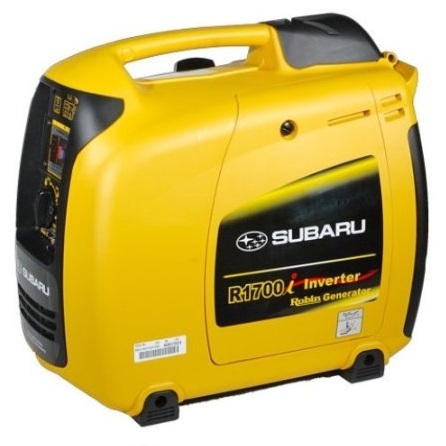 This gas powered Subaru R1700i inverter generator is ideal for power outages, camping, RVing and tailgating. It is lightweight at 45 pounds and has an air cleaner element and in line gas tank filter. It is easy to use and offers various features. This product costs around $1,000 online at Amazon. It has the fuel capacity of 1.1 gallons of fuel and comes with a two year warranty. It comes with a 24hp OHV Industrial engine. It has thick copper windings for added strength. It also can run up to four hours at 50 percent load. A nice feature is the automatic low oil shut down. This helps protect the engine life. An additional feature is the steel tubular base. It comes with a 12v DC for external batteries and it has an embedded heat sensor. It comes with GFCI receptacles and an inverter module that offers clean and stable power for sensitive electronics. It can run 1,650 watts rated and 3,200 watts maximum. Other features include the spark arrestor muffler for quiet sound at 59 decibels and the single dial control that allows the operator to control the on and off switch with one dial. This product is recommended for its fuel efficiency and long engine life.